"The Origin of The Justice League of America"
Ellen Baker returns home from an evening with a man named Roger (a notorious cheater), whose advances she turns down cold since she's not over Buddy. Just as she's about to go inside, Animal Man (still with the abilities of a sun-eater) appears to her. She rejoices in her husband being alive and well, but can't hug him until his abilities fade; she settles for sitting on the lawn and looking at him. Their children soon share in their reuinion. Meanwhile, Lady Styx's followers have found Buddy, who has a bounty on his head for what happened to their leader. At the memorial for Superboy, heroes gather for the one-year anniversary of his sacrifice, as well as in light of the lives lost in "World War III" started by Black Adam. Wonder girl hugs Wonder Woman after placing a wreath of roses at the base of Connor's statue. Cassie tells her (who in truth is Donna Troy, while Diana herself is in her new identity of Agent Diana Prince, working security) about Ralph Dibny, and how she'll never be able to apologize to him. All are in attendance, including the recently returned Bruce Wayne, now walking with Clark Kent, reflecting on the now-non-threatening following of Connor, "The Church of Kon-El", and Diana's new identity (Clark likes the glasses.) Robin (now in his one year later suit) listens to Rose complain about how Stargirl asked Wildcat if she should arrest her. Robin tells her to get over it if she wants to shake off the reputation of Deathstroke, her father. She says she's sorry for Terra and Young Frankenstein's death but she barely knew her. Robin walks away, saying if she wants to be�a Titan she had better learn. Kid Devil then approaches her and asks if she can introduce him to Robin. Tim, meanwhile, runs into Jimmy who asks him why red-and-black rather than red-and-green. He says it's to honor Superboy. Then he notices Wonder Girl next to Donna, but the pair fly off together before he can talk to them. On the planet Rann, Adam Strange awakens to overhearing three people discussing the Emerald Eye of Ekron. It is, in truth, an early prototype weapon from the Guardians' technology before the rings were concieved, but still a "devastating weapon in the wrong hands." Adam then sees (?) Green Lanterns, one being�John Stewart, and Sardath who welcomes him home to Rann. Adam is�overjoyed he can see again; Sardath attributes it to his�daughter Aleea providing copies of her own eyes, laced with gene enhancements that will allow Adam to see�across the entire�electromagnetic spectrum, making battles a little easier. Sardath then tells him Rann's been under siege by flame creatures for over a week. Adam quickly remembers Starfire, who was injured. John informs him she powered up�under "those three suns" and took off, mentioning something about a jacket. The other Lantern wants to know what he saw and�what the�number 52 means. Adam's attention is�instead on his wife and child, whom he quickly embraces, but not before telling them that Lobo has the Emerald Eye. John tells his friend to let Adam enjoy his family while�they tend to the monsters, who can be defeated by cutting off their oxygen (according to�Adam). At the Baker residence, Buddy and Ellen celebrate his homecoming with neighbors when the doorbell rings. Ellen answers to face Lady Styxx's aliens with laser cannons...who are destroyed by Starfire, unaware that Buddy is alive, and hands her his jacket as she collapses to the ground. Ellen asks if Roger hired a stripper. Buddy's son Cliff says "she's like ET - but with double DD's!" Buddy tends to her and tells him to knock it off when Cliff asks if they can keep her. The warring leaders of the planet Apellax had waited till the golden age of heroes on Earth had ended before initiating an attack...only to be met by a new generation of heroes and defeated. Heroes Black Canary, Aquaman, Flash, Green Lantern and the Martian Manhunter wished to continue the work of the now-retired Justice Society of America by forming a Justice "League". Later�cornerstone members Superman, Batman, and Wonder Woman soon joined, and its roster in the years since has changed countless times. Being invited to join had become a fantastic honor. Now in their headquarters in Washington DC, the Justice League serves as mankind's best line of defense against threats too powerful for one hero to handle. Main Story - 5: This week's issue definitely carries with it a sense that things have come full circle, as at the beginning of the year they commemorated the sacrifice of Superboy. Another connection with #1 is the fact that the Boy of Steel is only referred to as "Connor" and "a boy" by friends and media. The name Superboy isn't even MENTIONED! It's as if he's just a nameless individual with Superman's insignia standing next to Superman's own monument. After the events of World War III, it's now no longer a surprise to see J'onn J'onzz in his martian form, and thanks to this series questions such as Diana's new secret identity and Robin's new look are answered. It's rare to see Supes and Bats hanging out in daylight in their civillian identities, given that they travel in different circles. I like Clark's remark about Diana's glasses. Only now do I see the similarities (sunglasses, pulled back hair). Just goes to show you that the look is equal opportunity. The reunion of Animal Man and Ellen though could've been better. Why would Ellen tell Buddy to wear the suit for the homecoming? That makes no sense. And just how old is Cliff who remarks about Starfire's bra size? The only question involves Mr. Mind being the TRUE cause of glitches in Skeets' program. It's never been Skeets to begin with, but that annoying little worm who's apparently pulled a Killer Moth (Batman fans know what I'm talking about). As to what his intent is and how Rip and Booster are going to fix this are reason enough to read next issue. At least the talking Red Tornado head motif makes more sense. Then there's Lobo... usually merciful on space dolphins, it looks as though he feels he's been scammed and wants to use that emerald eye on the high priest. I always felt the Emerald Eye had a connection to Oa, which makes the connection to the slain Lanterns all the more clear. However, I must apologize for not knowing the name of John Stewart's co-Lantern; I don't follow the book. Wonder Girl's solitary existence at the beginning of Teen Titans' one year later story is starting to make sense for it not only involves the guilt over Connor but the guilt over what's happened to Ralph Dibny. Speaking of Dibny, how does anyone know what really happened to him if he's trapped himself and those demons at Dr. Fate's spire? All in all the writers have pulled out all the stops and I have to say bravo on this issue and the entire series. Art - 5: Three words: Bennet is the man. Okay, four words, but give me a break? His take on the DC heroes are iconic, always have been, and part of me wishes that he'd have been saved for issue #52. It's going to be hard to picture them finishing it off without Joe. Back-Up Story - 5: I realize I sound like a broken record each time I make this observation, but Waid's ability to condense such a rich and extensive history of a particular hero is great. However, he tops it by doing it for the premiere superhero team in comics history. Still, he neglects the fact that Wonder Woman was also one of the original founders. I don't remember Black Canary being in the mix. Guess it's post-Inifinite Crisis. I'm still waiting for his summary of Superman's origin. Guess he's saving that one for next issue; best for last right? I admit that Superman: Birthright was a tough pill to swallow, but it's grown on me in the long run, as have these new origins, so props to you, Mark. Sorry for often mispelling your first name. Back-Up Art - 5: One word (and I am keeping count this time): Spectacular. The visual of the JLA taking on the leaders of Apellax is great, but the chronology seems a bit off. At what point in the League's existence do they take them on? Anyway, the designs of the Leaguers are great, as is the reflection on its history and the ignoring of the Identity Crisis affair. However, the final shot of the modern JLA, with Superman flexing his arms makes no sense whatsoever. I mean what is this the Kryptonian gun show? Good Batman, though. Cover Art - 4: This time the cover WORKS extremely well, for it foreshadows a revelation regarding an element of the story that was hard to understand, the revelation the Tornado was like a glorified egg timer for Mr. Mind's gestation period. 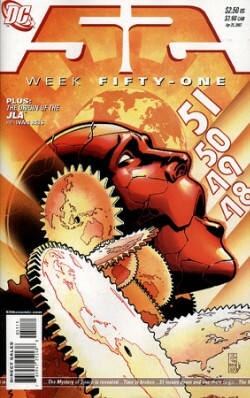 The cogs with Earth's continents on it was very well done.